Posted in: Radio Control, Team Associated. Tagged: Racing, RC. This is great news for Team Associated fans. VRC-Pro is a great way to upgrade your skills and get some indoor RC action on cold winter days. Check out the Team Associated press release below. Team Associated and VRC-PRO Join Forces! As a preferred partner, Team Associated‘s SC10 4×4 short course truck, the TC6.2 touring car, and the 1:12 scale 12R5.2 car will be highlighted in VRC-Pro. Team Associated will use VRC-Pro’s unique in-game advertising features to promote their brand and products. Beginning in 2014, Team Associated kit and RTR buyers will receive an included VRC-Pro voucher. The VRC-Pro voucher provides a great opportunity for Team Associated buyers, offering a fun and easy entry into the world of RC online simulation. Whether you are new to RC online simulators, a seasoned veteran, or any skill level in between, VRC-Pro is a great way to sharpen your skills and have a lot of fun doing it! 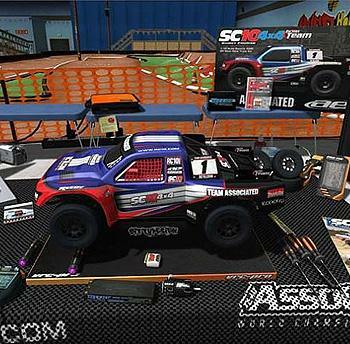 The included VRC-Pro voucher provides a promotional code giving free access to a full option SC10 4×4 Factory Team short-course truck to drive and race in the Free-to-Play VRC-Pro state-of-the-art RC racing simulator. So, be sure to look for your VRC-Pro voucher in your next Team Associated car, buggy, or truck purchase and get in the game! The complete press release can be found at Team Associated.